Call it a reference, call it stealing, or lazy, or being “inspired by”, one fact cannot be denied: Star Wars loves its homages. From whole plots, to character archetypes, to vehicle designs and dialogue, you can see the collage of homages built into Star Wars’ DNA right from the first frames of the first movie. As time has gone on, those homages have expanded to include Star Wars material itself. The breadth of Star Wars material is so vast, that it can successfully draw from other places within the multimedia empire to lend inspiration, or just pirate ideas wholesale. So, in lieu of doing a deep dive into Kanan and Hera’s ever-evolving relationship or how the Loth-wolves represent the same mystical elements of the Force that the Bendu did last season, we’re going to talk about something everyone loves to debate: whether the homages within these last two episodes are valuable, or just creative ripoffs used to get old-school fans to sit up and take notice. Star Wars Rebels is an odd show from a creative standpoint. The creative team is made up of people who grew up watching and reading about Star Wars rather than creating it themselves, so of course they try to slip in references both direct and indirect to stories and characters that they grew up with but, until now, haven’t been elevated to the same level as the film canon. We see this most blatantly with Thrawn’s inclusion, but once Thrawn is in the mix it’s only a matter of time before other elements of his trilogy begin to creep their way into the show as well. Ladies and gentlemen, from stage left and voiced by the fan-favorite Warwick Davis, please welcome Rukh to the spotlight. Now, let’s make one thing clear from the outset: the Rukh from Rebels is not the same as the Rukh from the Thrawn trilogy of books. For one thing, the Noghri are a very different race in the show than they are on paper. Gone, for instance, is their comic book-level ability to smell all the way back through people’s bloodlines just by sniffing their hand, replaced with a heightened sense that is believable but still alien. Rukh from the books was a personal bodyguard of the Grand Admiral who never left his side, while this Rukh (from what we’ve seen so far) is more of a freelance assassin and tracker, the sort of troubleshooter that someone in Thrawn’s position might use to do the dirty work he can’t put on the books. So at what point does Rukh stop being Rukh? Let’s be real here, Rukh in the books did not get much of a personality; he was stoic, he was loyal (for the most part), he was efficient and he was deadly. The boxes of a pebble-gray skinned alien with inhuman agility and speed match the physical description well enough, but those are not exactly difficult shoes for Rebels to have a character fill. 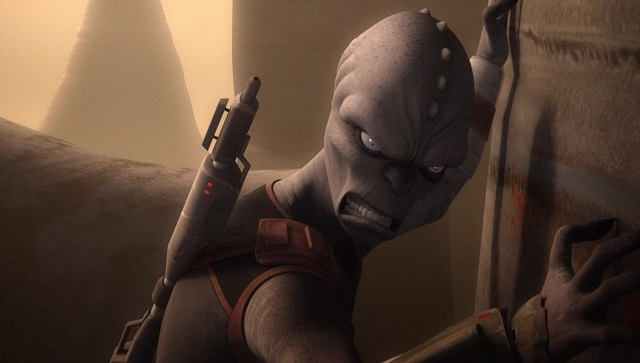 Still, the Rebels Rukh seems more aggressive and more of a wild card, back-talking Pryce and doggedly pursuing Ezra and Jai well after the other Imperials have given up. Consider as well that Rukh was basically defined in his previous appearance by his role as Thrawn’s personal bodyguard. A good ninety percent of races and characters from the Expanded Universe were defined by what we first saw them doing, so after twenty years of thinking of Rukh as a bodyguard, having him play a different part in his appearance here makes him seem out of place. Does that make his adaptation a bad one? I don’t believe so. Rukh’s role in the EU is being filled by the death troopers Thrawn has at his command in Rebels, so pushing him into the story as an out-of-nowhere bodyguard trusted above all Imperial decorum would have broken with in-story precedent purely for the sake of homage. This Rukh is obviously trusted by Thrawn (even above Pryce), but his role is different and better befits his skills, demonstrating just how dangerous and capable he is without a lot of exposition needed. On the flip side, the next episode gives us an homage that is not nearly as obvious but, in practice, works out to be even more accurate to the source material. I speak, of course, of the titular Crawler in “Crawler Commanders”. This is something I did not fully catch until reading the supplementary Episode Guide after viewing the episode initially because it’s not directly called out in any way through the episode’s course. Which, in a way, makes it much more of an homage than Rukh’s role in “Kindred”. The Crawler that the Mining Guild is using to help strip the surface of Lothal for its mineral resources, from its design to its purpose, is a direct reference to the World Devastator superweapons from the Dark Empire comic series. It’s obvious in hindsight, isn’t it? Obviously, the Crawler is much smaller than the World Devastators were, and as with Rukh their more, well, cartoonish abilities are downplayed. You don’t see the Crawler stripping ore from the planet and promptly pumping out fully-functional tools of war, nor does it appear entirely indestructible. But the main elements, the big, blocky ship that consumes all in its path and converts it to raw material without care for what lies in its way, is still there. 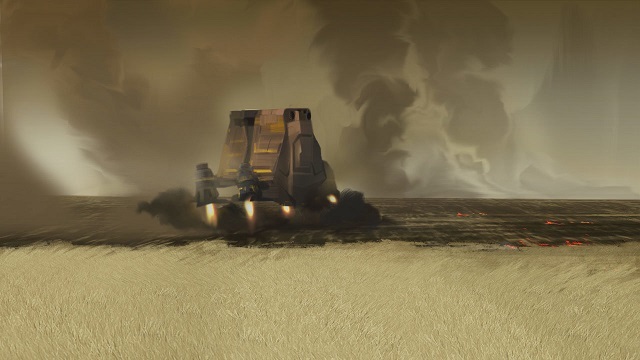 And now we know what is slowly killing Lothal: Mining Guild vehicles that are belching great clouds of polluted smoke into the sky with every acre of land they strip bare, each being run by slaves probably largely taken from the Lothal population itself. The Crawler is a very different homage than Rukh’s appearance. Its name, its size, and its role in the story are all far different from the source material. Yet, the vehicle’s function is largely, and even thematically, the same as it was in Dark Empire. It’s being used to callously strip a planet down to its very bones. It’s far from the focus of Ezra’s efforts to free his home, but putting a Crawler out of commission does move them one step further along their trek to save the planet itself. I’d say that’s the making of a pretty good, if stealthy, homage.